Sydney Cricket Ground, 29 September 1985: St George have been narrowly beaten 7-6 by Canterbury in the 1985 Grand Final in front of 44,569 people. Earlier in the year, St George and Canterbury played a 10-all draw in round six at Belmore (21 April) and in round 19, St George had defeated Canterbury 16-6 at the Sydney Cricket Ground (14 July). Saints had defeated Canterbury again in the major semi final 17-6 (15 September). On Grand Final day, Saints were favourites to win their 16th premiership. With both the under 23s and reserve grade winning their Grand Finals, it was up to the first graders to pull off the treble. Canterbury scored first with a try to winger, Peter Mortimer. In 1985, Saints were seeing a resurgence and were minor premiers in all three grades with most players being local juniors. Brother, Steve Mortimer was instrumental in pinning St George down as the halfback delivered a series of towering bombs onto St George fullback, Glenn Burgess who never faltered. But this effectively forced Saints into successive line drop outs. The following year, the rule would be modified to allow a 20-metre tap re-start should the defender catch the ball on the full. Canterbury took full advantage of this flaw in the rules of the day. a try to Steve Morris which was converted but Saints were unable to score again, Canterbury eventually winning by the narrowest of margins. WIN Stadium, 1 September 1985: Needing to win their last game of the year to avoid last place and the wooden spoon, Illawarra have gone down to 18-16 to Parramatta in front of a crowd of 8,243. 'DALLY M' ROOKIE OF THE YEAR Steve Linnane has won the end of season 'Dally M' Rookie of the year for 1985. The young halfback was signed to Saints just this year and was the season's top try scorer with 16 tries. In 1985, St George signed promising young winger, Ricky Walford. Hailing from Walgett NSW, Ricky was an Australian Schoolboy representative against NZ in 1981. He played for Easts (1982-83) and Norths (1984) before finding a home at St George. A speedy flankman, Walford is also an accurate goal kicker. In 1986, Saints finished the season in 7th position, missing out on a semi-final berth. SCG, 31 August 1986: 8,387 were on hand to see St George and Canberra played out an 18-all draw, effectively ending the Dragons' season. Saints fell short of a play off for fifth place by just one competition point. Saints went to into an extraordinary slump in 1986 when, for the first time in 50 years, all three grades missed out on the semi finals. Many put this down to the decision to refurbish Kogarah Jubilee Oval and the Dragons playing all their their 'home' games in 1986 at the Sydney Cricket Ground, effectively removing the home ground advantage. STEELERS WOODEN SPOONERS AGAIN Belmore Oval, 1 September 1986: Illawarra have been defeated by Canterbury 8-2 in front of 10,013 people to place them firmly at the bottom of the table for 1986. This the second year running that the Steelers have finished last. MICHAEL O'CONNOR SIGNS WITH MANLY Saints lost one of their star players, Michael O'Connor who will be playing with big spending Manly in 1987. A former Wallaby international, 'Snoz' came to Saints in 1983 from rugby union and played four seasons before departing at the end of 1986, and shortly before leaving on a Kangaroo tour. The superb centre played 71 games (plus seven replacements) for the Dragons and scored 33 tries, 130 goals and nine field goals for a total of 401 points. O'Connor continued to thrill crowds in Australia and overseas until his eventual retirement from Rugby League in 1992. O'Connor posted a number of records for NSW and Australia. STEVE MORRIS SIGNS WITH EASTS Halfback and winger, 'Slippery' Steve Morris has finished up with St George. Dally M' winger of the year in 1984 and 1987, Morris will see out his final career years with Easts in 1987 and Leeds in 1987-1988. The last player to represent Australia from the country, centre sensation Morris hailed from Dapto before joining Saints in 1979 as halfback. Coach Roy Masters moved Morris to the wing in the mid-1980s where he enjoyed enormous success. 'Slippery' played for NSW in 1978, 1980, 1984 and 1986 and played one Test for Australia in 1978. In all, Morris played 174 games for St George scoring 102 tries (357 points). In 1987, Saints had another ordinary season, failing to make the semis for the second year running and finishing in 9th position. SCG, 20 March 1987: Saints have suffered a humiliating defeat going down to Easts by 44-2 in front of 11,831 people. Easts whitewashed Saints eight tries to nil. Saints' halfback Steve Linnane has been suspended for 20 weeks by the judiciary after being found guilty of eye gouging Penrith's Greg Alexander. At the end of 1987, Roy Masters finished as coach of St George. Masters coached Saints from 1982-87 and in that time took the Dragons to the semi finals in 1983, a preliminary final in 1984 and minor premiers & grand finalists in 1985. Captain Craig Young was short listed as his successor but an outsider is more likely considering the current trend to have a non-playing coach. St George have secured the services if young local junior, Brad Mackay. The talented utility player equally at home at lock, centre or five eighth. WIN Stadium, 30 August 1987: The Steelers have outclassed Cronulla 24-4. Illawarra hammered their neighbours 4 tries to 1 in front of a small crowd of 5,726. Illawarra ended their season in 11th position, four points clear of last placed Wests. Brian Smith has accepted an offer to coach Hull in England and will not be coaching the Steelers in 1988. New coach will be former Parramatta forward, Ron Hilditch. Brian 'Poppa' Clay passed away in September 1987 after a long battle with heart disease. 'Poppa', so named because of his bald pate, was widely regarded as one of the best and toughest pivots to ever play for St George. Clay was a popular clubman who represented Australia in the World Cup in 1957 and played five Tests in 1959-60. Best remembered for his role in eight Grand Final wins, Clay's career stats include 200 grade games. Brian Clay retired as a player in 1967. The slump, one of the worst in the history of St George, coincides with the decision not to play at Kogarah due to venue upgrades. The on-field woes continued into the latter part of the 1980s whilst 'sharing' a home ground with Canterbury at Belmore. Work on Kogarah Jubilee will not be finished before 1989. Ted Glossop took over as coach of St George in 1988 following the departure of Roy Masters. 1988 saw the inclusion of three new teams: Newcastle, Gold Coast and Brisbane into what used to be referred to as the Sydney premiership. In 1988, both St George (10th) and the Illawarra (13th) failed to qualify for the NSWRL first grade semi-finals. Sydney Football Stadium, 4 March 1988: Saints had an historic victory over Easts at the first ever Rugby League game to be played at the all new 40,000 capacity Sydney Football Stadium. Saints won the night match under lights, 24-14 in front of 19,295 spectators. St George 16 have defeated Balmain 8 in Wednesday night's Mid-week (Panasonic) Cup Final. Dragons lock Peter Gill was named Player of the Series. Endeavour Field, 14 August 1988: St George have lost narrowly to minor premiers, Cronulla 16-14 in front of 18,111 people. This was Saints' last game of '88 and saw them finish 10th in a 16 team comp. Sydney Football Stadium, 14 August 1988: A crowd of 3459 saw Steelers hammer Easts 31-10 by scoring five tries to two. However, Illawarra had an ordinary season and finished 13th. St George captain, Craig 'Albert' Young has retired from Rugby League. The big prop forward first came to notice in 1972 in the undefeated Australian Schoolboys tour of England. Craig was a first grade soccer player in the Illawarra competition. He switched to Rugby League and played for Corrimal before joining St George in 1977 and was a star in Saints premiership victory that year. In 1978 he played in all five Tests on the Kangaroo tour and was named player of the tour. At just 22 years of age, Young captained St George to their 15th premiership in 1979. Young was a Kangaroo again in 1982 and 1984. He retires in 1988 but is expected to take up the coaching job in 1989. St George (1977-88): 234 games (including replacements), 11 tries, 2 f-goals (42pts). Australia (1978-82 and 1984): 20 Tests, 1 try. In what was seen as a smooth transition, recently retired captain Craig Young (pictured during his playing days in 1985) has taken over the 1989 coaching reins from Ted Glossop who served just the one season as coach in 1988. St George have signed Rugby Union convert, Scott Gourley. Originally from Narribri, the son of former St George prop Robin Gourley. Scott captained the 1986 Australian Rugby Union Schoolboys to New Zealand before touring the United Kingdom with the Wallabies in 1988. Gourley decided in 1989 to switch codes and join his father's former club. 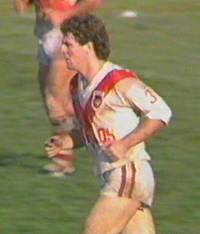 St George first grade also gained the services of Queensland junior and Brothers (Brisbane) centre, Mark Coyne in 1989 after he was originally graded in the St George reserves in 1988. His brother, Peter Coyne was to follow Mark to Saints three years later and partner him in the centres but it was Mark Coyne who would have a long lasting relationship with the Dragons for more than a decade. In 1989, St George (10th) again failed to qualify for the NSWRL first grade semi-finals. Illawarra (16th - last) faired worse, picking up the wooden spoon. 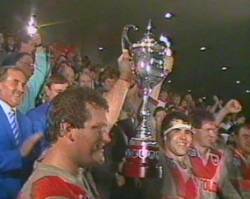 Saints have finally returned to Kogarah Jubilee Oval for the '89 season after three years of being without a proper home ground. Unfortunately it didn't help Saints' standings in the premiership as they finished 10th for the second year in a row. For the third time in their short history, the Illawarra Steelers have been lumbered with the wooden spoon. In '89, the Steelers have conceded more points than any other team on their way to last position. Ricky Walford (pic right) became the season's leading point-scorer for 1989 with 146 points consisting of 13 tries and 47 goals. In the same year, Ricky gained rep duties when selected for Country Origin. Promising young St George forward, Geoff Selby (pictured left) was tragically killed in a car accident in February 1989. A St George junior, Selby was graded at Illawarra on the recommendation of James Cook High teacher and Illawarra coach, Brian Smith in 1984. He returned to St George in 1986 under the guidance of Johnny Raper. Playing at lock or second row, Geoff Selby played a total of 39 games for Illawarra scoring nine tries plus a total of 44 games for St George (18 replacement) scoring four tries.